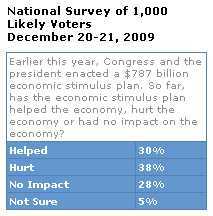 There is increasing evidence mounting that Barack Obama’s $787 billion stimulus bill (the euphemistically-titled “American Recovery and Reinvestment Act of 2009” as opposed to “The Porkulus Act of 2009” or “The Generational Theft Act of 2009) has utterly failed to deliver anything that Obama promised. As I reported in my article, “Obama Wreckovery Act And Stimulus ‘Employment’: The Pathetic Reality,” it has utterly failed to produce jobs. In rushing the bill through Congress when unemployment was at 7.2%, Obama promised the country something that is now laughable: his administration assured America “that the economic stimulus would prevent unemployment from rising above 8 percent.” It is now over 9.4%, and is expected to enter double-digit territory before the end of the year. On Thursday June 25,The Labor Department data released Thursday show jobs remain scarce even as the economy shows some signs of recovering from the longest recession since World War II. The department said initial claims for jobless benefits rose last week by 15,000 to a seasonally adjusted 627,000. Economists expected a drop to 600,000, according to Thomson Reuters. Several states reported more claims than expected from teachers, cafeteria workers and other school employees, a department analyst said. The number of people continuing to receive unemployment insurance rose by 29,000 to 6.74 million, slightly above analysts’ estimates of 6.7 million. To make it even more laughable, many of the very jobs that Barrack Obama had heralded as “saved” – including private sector jobs at Caterpillar and government sector jobs at the Columbus, Ohio police department – are the ones being wiped out. But even though Obama’s stimulus has hurt the economy, it doesn’t change the fact that we’re still going to have to pay the bill for it. And that bill WON’T be for $787 billion; it will be for $3.27TRILLION. The plan has more than $3 billion in “neighborhood stabilization” and Community Development Block Grant funding, much of which may go to benefit ACORN, a low-income housing and voter registration “community” organization that is under federal investigation for its suspicious voter registration practices. $1.3 billion to bailout AMTRAK, the perennial money-loser railroad. $1 billion for educational programs, including courses on sexually transmitted diseases. $30 million for restoration of wetlands to be spent in the San Francisco Bay Area – House Speaker Nancy Pelosi’s district. The money will go in part to protect the endangered salt marsh harvest mouse. $200 million for a low-pollution, coal-fired power plant in President Barack Obama’s home state of Illinois. $45 million for ATV four-wheeler trails, and government office renovations, according to RNC Chairman Michael Steele. $200 million to provide computers to community colleges. $50 million for the National Endowment of the Arts. Over $650 million in coupons to help consumers buy digital TV converter-box coupons. A reported $300 million for hybrid vehicles and electric-powered cars. According to the Washington Times, this item will include buying golf carts for federal workers.GOP Sen. John McCain summed up his view of the bill: “This measure is not bipartisan. It contains much that is not stimulative.”Some of the criticisms of the bill, however, center on policy rather than cost.The Heritage Foundation, for example, reports the bill reverses the bipartisan welfare reforms achieved during the Clinton administration.Also, opponents have slammed the bill for being “anti-religious,” because it expressly prohibits the use of stimulus funds for faith-based schools, schools of divinity, facilities used for “sectarian worship,” or places of religious worship. 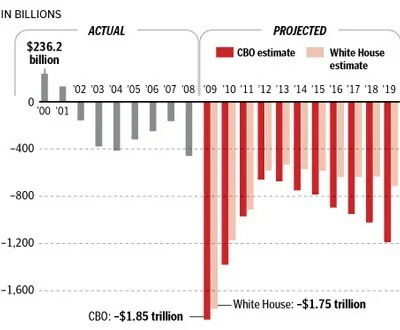 So while the media continues to report “$787 billion stimulus” to mask the actual devastating cost of this mess, in point of fact we’re not talking about a colossal $787 billion boondoggle; we’re talking about a mega-colossal $3.27 trillion boondoggle. There are a whole lot of questions about whether Obama is creating any jobs with his massive government spending (beyond his fairy tale “saved” jobs that the US Bureau of Labor Statistics has said can’t be verified – and can you even imagine the mainstream media allowing President George Bush to hype job numbers that he couldn’t verify??? ), but there is no question at all that the trillions of dollars being spent are all-too-real. And there is no question that a great big giant lead anvil will fall on the US economy due to the near doubling of the national debt as Obama adds a projected $9.3 trillion to the $11.7 trillion hole we’re already in (which doesn’t count the tens of trillions of dollars in unfunded mandates from Social Security, Medicare, etc). Obama is borrowing 50 cents on the dollar as he explodes the federal deficit by spending four times more than Bush spent in 2008 and in the process “adding more to the debt than all presidents — from George Washington to George Bush — combined.” And most terrifying of all, Obama’s spending will cause debt to double from 41% of GDP in 2008 to a crushing 82% of GDP in 2019. Now you have to add to that the fact that the Democrats are pushing a $3.5 TRILLION health care bill that will socialize – on top of a big chunk of the economy that already HAS been socialized (e.g. banks, auto companies) a further 1/6th of the US economy. And you have to add in the staggering future costs to our economy that will be imposed by the Waxman-Markey (or as I prefer to call it, the Wackjob-Marxist) cap-and-trade bill that will result in capping productivity and trading away our prosperity: $6,800 per family of four by 2035, even as our energy costs skyrocket (or to quote Obama himself: “Under my plan of a cap and trade system, electricity rates would necessarily skyrocket“). And as energy costs (and therefore production) increase dramatically, do you think employers will hire more workers, or fewer and fewer? All that staggering hyperinflation-creating debt-funded government spending, along with the simultaneous nationalization of our economy and the systemic undermining of our productivity, and about the only jobs that are being created are for washing cars and running errands for politically-connected Democrats. By the time the American people understand what has happened to their economy and to their way of life, it’s going to be too late to undo the damage that will have been done.